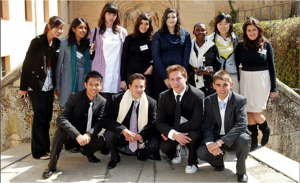 From April 13th – April 15th 2011, IE University’s Junior Advisory Board will hold its third annual meeting. Founded in 2009, promoted and organized by IE School of Arts and Humanities, The Junior Advisory Board is a highly selective group of pre-university students, aged from 15 to 19 years old, who advise IE University on the future of university education. IE University decided to create the Junior Advisory board with the principal aim to gain firsthand knowledge about the concerns, the interests and the values of the rising generations. The 12 selected members of the JAB have undergone a rigorous selection process based on academic excellence, the projects they have undertaken and their active role in their communities. These young minds represent 5 regions of the world and come from Czech Republic, Colombia, India, Jordan, Peru, Romania, Spain, Swaziland and the US. This year, during the workshops in Madrid and Segovia campus, the Junior Advisory Board members will be familiarized with the importance of Communication as an interdisciplinary discipline in the university education, they will strive for an in-depth understanding of Corporate Social Responsibility and “Base of The Pyramid” and they will be asked to think about how universities can help students to create their own companies. These workshops will be moderated by Vincent Doyle, Professor of Communications, Waya Quiviger, Director of Master in International Relations and Juan Lago-Novás, Executive Director of Master in Architectural Management and Design.